ASBURY PARK, N.J. (AP) — Oh what a night: Frankie Valli and the Four Seasons were inducted Sunday into the New Jersey Hall of Fame, but it was Bruce Springsteen who stole what could have been Meryl Streep’s show. 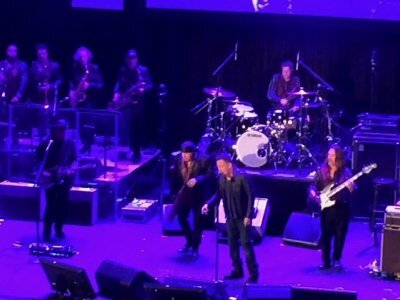 The Boss made a surprise appearance at Asbury Park’s Convention Hall to introduce his longtime friend and guitarist Steven Van Zandt into the hall. Springsteen himself was admitted a decade earlier. The two joined forces onstage and played “I Don’t Want To Go Home,” trading vocals and eventually welcoming the entire class of inductees — and many of their family members — onstage to close the show. “We did the impossible: We made New Jersey hip,” said Van Zandt, who is from Middletown. Meryl Streep, of Summit, who actually was named to the hall in its first year in 2008 but has yet to appear at an induction ceremony, had to bail again due to a production conflict with her hit HBO series “Big Little Lies.” Because of that, she has not yet officially entered the New Jersey hall. Other performers getting the nod included Blondie lead singer Debbie Harry, of Hawthorne. She confessed that while on tour, she gets really sad if she misses tomato-ripening season in New Jersey, and that she has long wanted to name an album “Jersey Tomato,” but never did. Frankie Valli, who also is from Newark, and his Four Seasons bandmates Bob Gaudio, Tommy DeVito, Nick Massi and Joe Long, also were inducted. Astronauts Mark and Scott Kelly, of Orange, were inducted, along with Republican Congresswoman Millicent Fenwick, of Bernardsville, the inspiration behind Lacey Davenport, a fictional character in the “Doonesbury” comic strip; nurse Clara Maass, of East Orange, who died after volunteering for medical experiments to study yellow fever; Olympic soccer gold medalist Carli Lloyd, of Delran; publisher and flat-tax advocate Steve Forbes, of Morristown; businessmen Joe Buckelew, of Lakewood, and Jon Hanson, of Bogota; author Harlan Coben, of Newark; novelist and Pulitzer Prize-winning journalist Anna Quindlen, of South Brunswick; and TV “Cake Boss” Buddy Valastro, of Hoboken.